Ranskill Primary in the news...again! Read this article about the improvements to our outdoor learning areas. Ranskill Primary School Football Team played their socks off this week to beat Blyth 4-1. It was a great match which tested both sides well but Ranskill just had the required 'edge'. Goal scorers were Archie, Liam and Aaron in the first half and Harry in the second half. Blyth squeezed a goal in just as the final whistle blew. Goal keepers Oliver and Maddie did a great job at defending their net and the whole team put on a great show of sportsmanship. Well Done!!! Thank you to everyone who supported out Macmillan coffee morning. We raised an incredible £458! On Tuesday 17th July, children in Years 5 and 6 performed their end of term show: Darwin Rocks. Below are photographs courtesy of Cris Janson Piers. These are available to order. Ranskill Primary in the news! Read this article all about our amazing community litter pick. Ranskill Primary School is proud to present 'The Ranskill Weather Station'. This will be a great asset when children are learning about the weather, interpreting scales in real life and taking an interest in the world we live in. The station was funded by the children themselves, using the money raised from the litter pick back in May. Playtimes are now a little bit more interesting too, thanks to some new 'Tic-Tac-Toe' pebble games. These have proven very popular during the recent hot weather. Watch out for further projects being completed soon! Our Radiant Ranskill project is going well. We have had a variety of mums, dads and children volunteering to tidy up the school grounds and the impact is already noticeable. The fences and benches have been protected and brightened up and the overgrown bushes and shrubs have been cut back. Work will continue up to Friday 29th June and that session will end with a few tasty treats as a thank you for all the hard work that has been put in. Children from Year 4/5 enjoyed the annual residential to Hathersage where they participated in the Stannage Edge challenge. During the week before half term, Mr Mody went on an expedition with other Nottinghamshire headteachers to China. The purpose of the visit was to form a partnership with a school in China. There was opportunity to take in some of the sights in Shanghai and Ningbo, but the highlight of the visit was to Nanmen Primary School - which is now our sister school! Thank you to Mr Simpson who has added the final finishing touches to our time capsule. Aside from the occasional cleaning and maintenance, it won't now be touched for another 50 years! On Friday 30th June, the school community celebrated the 50th anniversary with a huge garden party. There was go-karts, lazer tag, Punch & Judy, face painting and circus skills workshops. The children also performed a 'flash mob' dancing along to hits from the 60s, 70s, 80s, 90s, 00s and more modern music. During the afternoon, a special time capsule (provided by One Site Laser) was buried by Mr Robin Wilson, Deputy Lieutenent of Nottinghamshire with instructions for it to be unearthed in 50 years' time! (Thanks to Mr Cotton for some of the photographs below). The School Games Mark is a Government led award scheme launched in 2012, facilitated by the Youth Sport Trust to reward schools for their commitment to the development of competition across their school and into the community, and we are delighted to have been recognised for our success at the bronze level. Over the weekend of 10th / 11th June, the annual scarecrow festival took place in Ranskill and Torworth. There were over 50 entries, despite it being a rather wet and windy morning. The judges found the task, as always, very difficult. Click below to find out details of the shortlisted finalists along with the overall winners. Children and staff got in to the spirit and dressed up as their favourite fictional characters. 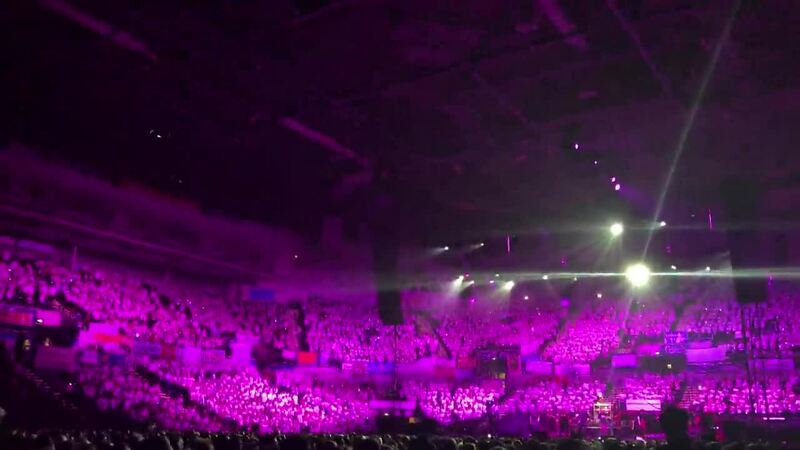 Children across KS2 enjoyed performing at The Sheffield Arena for the 'Young Voices 2017' We're hoping this is going to become an annual Ranskill tradition. On Friday 10th June, staff and children celebrated HRH Queen Elizabeth II 90th birthday by having a specially prepared picnic in the school grounds. The weather, although cloudy, was perfect for the event. The school playground was decorated with Union flags, Union flag bunting and bunting that the children made themselves. The children spent the morning learning about the life of our our monarch before enjoying the festivities at lunchtime.